Back-Up Story: "The Origin of Mister Terrific"
Jake and Natasha follow Dr. Dennis Laughlin, who can lead Nat to the information she needs on the secrets of the Everyman Project. They manage to get into his lab and confront him moments before the place explodes. Mercy Graves arrives with a security team and Nat and Jake watch from their vantage point on the ceiling as Mercy finds something that interests her greatly. Ralph Dibny and the Helmet of Fate search the ruins of Atlantis for the Shackles of Arion. After finding someone who may or may not be Aquaman they locate the Shackles and Ralph is forced to part with his wedding ring to take the warped link that is needed to keep the ancient beast the chain contains. The Four Horsemen are finally sent to attack Black Adam. Doctor Tyme confronts Sivana about Sivana's search for his missing fifty-two seconds. Sivana admits that he hadn't been looking for it but instead was working on artificial time in particle form which he has named Suspendium. Meanwhile Dr. Morrow confronts Will Magnus about his acquisitions of tin cans, mercury thermometers, a missing gold watch and lead shielding. Magnus assures him that it is all a subconscious coincidence and points out an Internet piece showing the armored form of Red Tornado. Morrow becomes excited and leaves. Moments later Magnus admonishes Mercury for revealing himself and once more asks him to stay out of sight. Elsewhere in Kahndaq Black Adam and Isis discuss Osiris' reclusive behavior with Sobek. Suddenly there is a loud boom and just as suddenly all of the plant life in the gardens begins to die. Natasha continues her surveillance of Luthor, who is in the Alpha Lab at the moment. Jake tells her that he has something to show her. Nat follows and Jake leads her to a hidden room containing the partially eaten corpse of, much to her surprise, Jake. The supposed Jake morphs back into his true form of Hannibal and the two begin fighting. Suddenly Lex Luthor arrives and it becomes immediately clear that he has developed super powers. Nat is confused since he had always come up incompatible in the previous tests. Luthor reveals that Dennis had been lying all along and proceeds to savagely beat her. Nat calls him an animal. Luthor corrects her asserting that he is Superman. "The Origin of Mister Terrific"
Michael Holt was a child prodigy who was not only inordinately intelligent but a natural athlete as well. His older brother Jeffrey was born severely retarded and died at the age of fifteen knowing little but the love his younger brother had for him. Michael always felt this wasn't fair. Despite growing up as an Olympic decathlete, accumulating multiple degrees and a personal fortune Holt never found his true purpose until meeting his wife who died tragically young in a freak accident. Holt considered suicide but eventually decided that if the world wasn't fair then he would make it fair. Assuming the identity of Mister Terrific Michael Holt eventually joined the Justice Society and currently serves with that team in addition to being one of the elite royals of Checkmate. Main Story - 5: So was that back dating of the last Luthor/Natasha scene done on purpose? I mean one segment it's Day 6 and then suddenly it's Day 5 again? Was this a mistake or done on purpose? Anyone got a line on this? And so do the various plotlines running through this book. Black Adam and Isis (along with Sobek) got a little screen time to foreshadow something pretty dark I'm assuming. There was the little reveal that Mercury is hanging with Doc Magnus, unless of course that Magnus is so crazy that Merc is a hallucination. We got something called Suspendium, more Egg Fu, and another piece of the Ralph Dibny puzzle. Oh yeah, and Lex Luthor got super powers. This was a neat little reveal. The fact that Luthor had been lied to all along shows that Laughlin had more sense than anyone had given him credit for. I liked this. I honestly didn't expect it either, which is nice. It took me a pass to realize that Mercy had found the real test results at the beginning of the issue but once I realized that those results are what she had found I was impressed at how the writers played it out. I was also more than a little unnerved at seeing the actual, deceased Jake on the table with the plate, fork and knife. Wow. That was so unnerving but at the same time I thought this played nicely into the whole betrayal of Natasha. Yeah, Natasha betrayed Luthor first but at the same time he's the bad guy so it's okay for him to be betrayed. It was actually kind of sad because Natasha thought she had everything wired, so even when she's doing the right thing she seems to be doing it the wrong way. This has been a running theme for Natasha; thinking she knows what she's doing and then having the fact that she doesn't driven home, this time violently. Natasha's journey was never my favorite portion of the series but considering that I have followed the character since her inception I've had more of an emotional response to her relationship with Steel and her joining Luthor's team than Ralph Dibny's story or even Renee Montoya's part of the series. But God, the whole Hannibal thing. I mean the dude eats people and can assume their shape. Wow, that's really Stephen King of the writers. So Luthor has super powers, the Four Horsemen are going to start a ruckus with Black Adam and Ralph Dibny ditched his wedding ring for the greater good. Yeah, I'd say things were popping in 52 this week. Art - 4: The art has been the most consistently satisfying part of this series. All of the artists have their own distinctive style and strengths but there are enough similarities that there haven't been any jarring changes in the look of the series. Andy Smith and Ray Snyder did a solid job, especially with the more hard hitting scenes like the previously mentioned dinner with Hannibal. Backup Story - 5: This is the first origin that produced such a strong emotional response from me. Mark Waid really played up the tragic nature of Michael Holt's origin. His brother was mentally handicapped and died at a young age. He found a woman he loved and she died in a freak accident. In two pages Waid evoked more emotion and feeling for a character than most writers can do in a six part story arc. Plus I like Mister Terrific, so it was cool to see him get the origin treatment. Art - 4: I enjoy Van Sciver's style, so this two page bit did a lot for me. Like the writing it hit all of the beats it needed to and I enjoyed Van Sciver's version of the Justice Society. 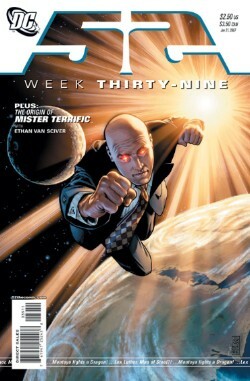 Cover Art - 4: You know if his eyes weren't glowing like that I half expected to see Luthor wink at the camera as he flew off into space. Still and all this is an eye catching cover. I can't imagine someone trying to get into this series thirty-nine issues in but I can imagine someone passing this cover in the shop and going, "What the huh?" It doesn't hurt that it is a great looking cover as well.